Here at Who What Wear UK, we're all about delivering the latest and greatest shopping edits, as approved by our team. That's why we've created a new shopping column, The Joy of Shopping, which will see me, Joy Montgomery, heading to all your favourite stores to test out new-in pieces IRL. 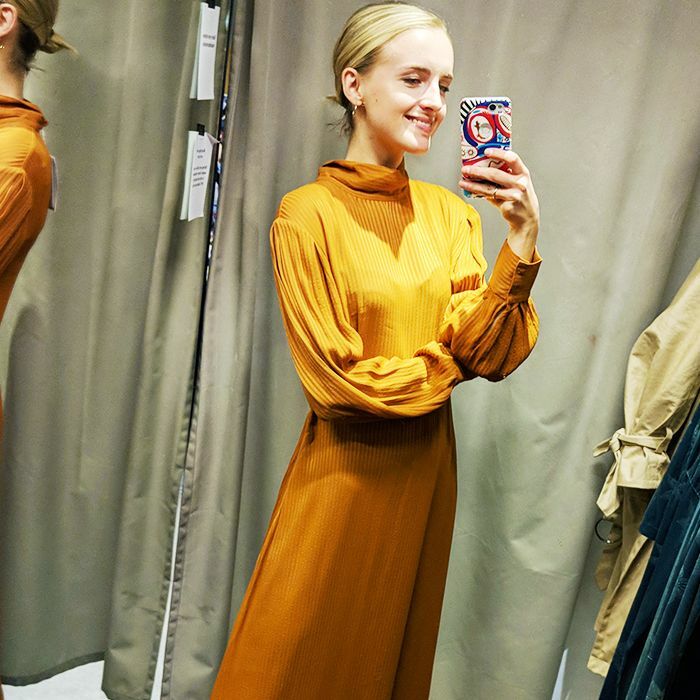 From summer dresses to the brands you might've forgotten about, prepare for changing room selfies aplenty. Is there something you'd like me to cover? Make sure to tweet or Instagram me your requests! Back in December, I wrote a piece about the style circles that presided over the fashion world in 2018. Overwhelmingly (if not exclusively), these circles were made up of designer-loving individuals decked out in the latest must-haves. However, anyone who has shopped the high street will know that even the affordable end of the fashion chain is ruled by its cliques. Imagine the British high street is a house party. Topshop and H&M would be the bright young things at the centre of the action, Zara and Mango would be the reliable BFFs that bring the booze, Arket and & Other Stories, meanwhile, would be the slightly aloof, well-dressed sisters keeping a watchful eye over the proceedings. L.K.Bennett, Hobbs, Jigsaw and Boden? Well, they'd be the horrified parents who return at 1 a.m. to clear up the mess. When Who What Wear UK's Hannah Almassi challenged me to base my next shopping story on the "parent" brands of the high street, I was uncertain, to say the least. Aside from the odd coat from Jigsaw, I had never given these brands much attention and had them firmly filed under "Kate Middleton" in my mental fashion folio. They existed as a totally separate style subspecies to my own. Turned out that I was seriously missing out. 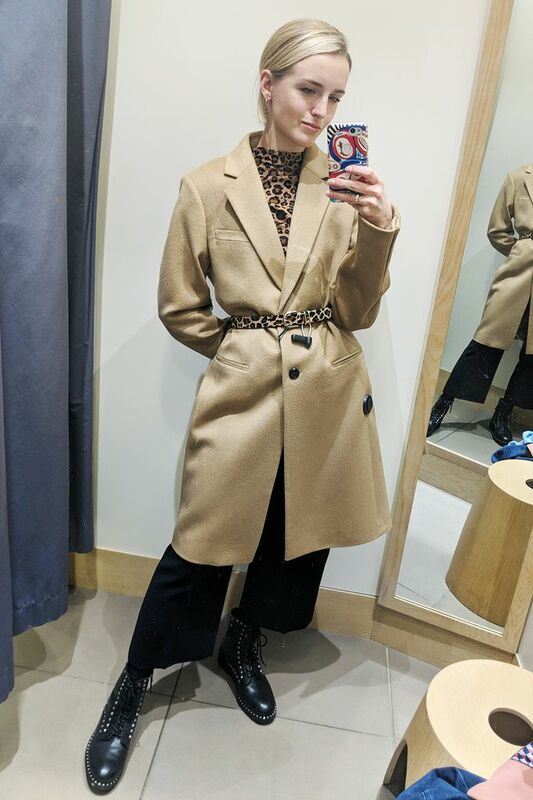 Yes, they may cater to a more mature audience, but over the course of my shopping trip, I discovered that, with the right eye and well-chosen accessories (chunky boots are a godsend), you can create some seriously good looks. With "quality over quantity" becoming our shopping mantra this year, it's brands like these that are rising to the fore with their timeless cuts and made-to-last fabrics. So why not mix it up and shop outside your style circle this year? Who knows? You just might find a new fashion fave (I know I have). Scroll down to see and shop all the pieces I found at L.K.Bennett, Hobbs, Jigsaw and Boden. Style Notes: It would be sacrilege to feature these brands without including a classic, tailored camel coat. Annoyingly, there was only a size 16 available, but then I had a brain wave: I decided to embrace the oversized fit by cinching the waist with a skinny belt and adding a leopard-print top (which I wore back-to-front) underneath. The final effect was seriously high-end–looking, if I do say so myself. Style Notes: In any other context, this suit might come across a little too stiff, but when paired with a Breton top and chunky boots, it's transported into Parisian It-girl territory. The jacket hung so well thanks to its weighty fabric, however (as was the case with all the brands), I would size down for a more modern fit. This is definitely one of my favourite outfits. Style Notes: Jigsaw knows how to do good staple pieces, but my dilemma was this: How do you make them feel on-trend? Lime green is set to spike this year, so this V-neck cardi was the perfect personality piece to build my outfit around. A fitted roll-neck (in the softest fabric) added an interesting contrast, while the leather midi instantly toughened up the whole look. Style Notes: I'm having a bit of a renewed love affair with skinny jeans this season, and this pair from Jigsaw is the ideal fit to complement lace-up chunky boots. The jumper was super warm and offered a lovely tonal finish with the wool coat (which, in an ideal world, would be a little longer). An easy yet stylish look for the weekend. Style Notes: I fell in love with this cardigan and midi skirt the moment I saw them. The knit is a good option for the cardigan-ambivalent because its slouchy fit makes it feel a little less old-fashioned. Pleated skirts aren't usually my go-to skirt style (they can sometimes be a little bunchy around the hips), but this one fell beautifully thanks to its well-draped, weighty fabric. Together, they make for a winning ensemble. Style Notes: Worn with beige heels and skin-coloured tights, this dress would be in Kate Middleton territory, but when it's paired with chunky boots, suddenly it's all kinds of cool. Aside from the fact that it's missing a few buttons (something I realised post-photo), I enjoyed the vibrant green print and flattering fit-and-flare silhouette. It would also look cute with a hairband, pearl accessories and patent flats in spring. Style Notes: As I entered Boden's concession in John Lewis, I was drawn to this coat like a moth to a flame. The calf-grazing length paired with the go-faster stripes created a suitably dramatic effect. I wasn't mad about the big blue buttons, but this can be easily remedied (I would probably snip off and replace with brass, military-style buttons). 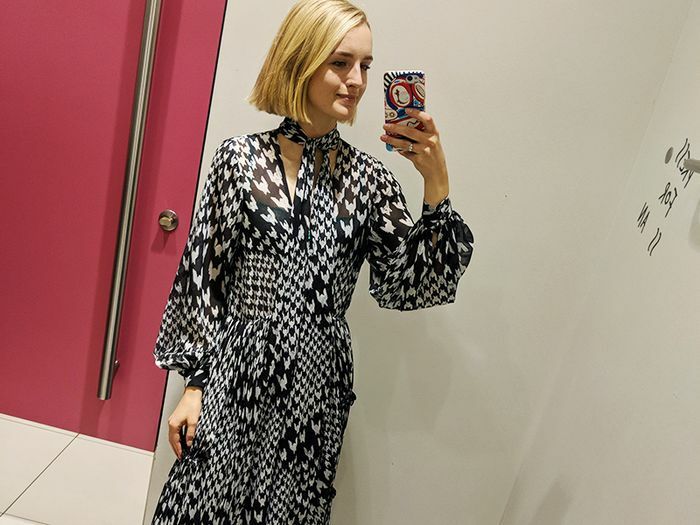 Style Notes: There are plenty of printed midi dresses around at the moment, but if you're anything like me, you probably haven't looked in L.K.Bennett. This midi dress is super versatile and could be adapted for all occasions. I would wear with knee-high boots and a black roll-neck while the weather is still chilly. Style Notes: While I've admired the Michelin Man–like proportions of the puffa coat from afar, I've never quite been able to get on board with the trend. This Hobbs number, however, just might convince me thanks to its longer length and streamlined silhouette. Also, as a sidenote, it was ridiculously warm. I could happily live in this baby all winter.